In Faith in the Fog, bestselling author Jeff Lucas explores the pain and fear that many Christians feel when walking through a spiritual fog, when doubts about faith undermine the joy of belief. After the Resurrection---when the disciples found themselves on the fog bank of unresolved shame, failure, and confusion---what Jesus did to help them and what he didn?t do is both enlightening and inspirational. Here, you will focus on the person of Jesus and the way he approaches those who are worn out when life is tough. Who Jesus really is---rather than the way we instinctively perceive him emotionally and theologically---is what will make the difference and help clear the fog. Through a broad approach, Faith in the Fog tackles the feelings of failure, uselessness, and shame, which are often the underlying causes of depression and burnout among Christians. 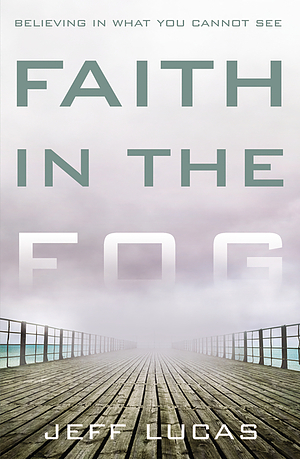 Faith in the Fog by Jeff Lucas was published by Zondervan in February 2014 and is our 14560th best seller. The ISBN for Faith in the Fog is 9780310281542. When I purchased Jeff's book a few weeks ago I did what many do with books...put it in my "plan to read" stack. There it has waited for the time when I would pick it up and actually take the dive within. Yesterday was the day. I pulled it out in the morning, began reading, and didn't put it down until the afternoon when I had turned the last page (yes, including acknowledgements). This was quite unusual because I had a day of work in the office planned and some deadlines looming...but instead I found myself experiencing an impromptu day, one which took me on a journey that I never could have predicted. While reading the book I believe I traveled through the full expanse of human emotion. At one moment I was belly laughing as a surprise insight into the hilarity of human behavior jumped out unexpectedly like a rabbit from behind the bush. The next moment I was weeping profusely as a truth of real life sunk into the deep and hidden recesses of my soul and unearthed the buried but subtly influential pains within. I realized that in those remote places lie the things that make us most human...the seemingly shattered dreams, the longings unfulfilled, the life script that seems to have gone awry. Tucked away out of sight are the hopes and aspirations that have been battered by the waves of time and reality and have been reshaped and reformed but are still attempting to stand. Multiple emotions in juxtaposition, overlaying yet not competing, expanding and deepening, yet not crushing. This is what I experienced in a bolus yesterday as I dove beneath the waves and not only took a look around, but engaged in the journey of "Faith in the Fog", allowing my heart to feel to the depths. It was a cleansing and refreshing time for sure. It was also a time where the lingering questions came into full view. Can I trust God in the fog? Can I know that He is able to work even in the darkest of places when He seems so silent? Can I release the fear that my life would mimic the pier that just dropped off into nothingness at the end of the walk? It's crazy to reveal that even as a life-long believer the questions return and even persist. Yet it is in the vulnerability of humanity that I have found the greatest of freedoms. I have to know that it is the only place from which to minister. I am thankful that Jeff wrote Faith in the Fog. I am thankful that he is not afraid to confront the party line or the status quo...the words and clichés that taunt and tease, the expectations and assumptions that leave one dangling on the cliff realizing that the rope you thought would take you to the summit is in fact only tied to a fragile tree eking out existence in the crack of the rock. I am thankful for the reminder that even in the fog there is a God who is present. He may be mysterious and He may not allow our questions to be answered. He may do things totally outside of our imagination or expectations. He usually does. But He is there. He is faithful. He can be trusted...even in the fog. Got a question? No problem! Just click here to ask us about Faith in the Fog.